Swimming with Ningaloo's whale sharks (WA) - did anyone say 'bucket list'? Australia has The Reef – there’s no denying that – but then there’s The Other Reef. Which is ‘better’? We were happy to keep mum on the topic, but the panel was not – and in a major upset by 0.01 of a point, they’ve deemed Ningaloo and her whale sharks the better holiday. But why? It’s a tough one to answer, but we’ll try. Ningaloo is one of the few places in the world where you can simply wade into the water and begin snorkelling (though interestingly, so is the GBR’s Lizard Island, see #11), its red sand environs are stunning, and the experience of swimming with those whale sharks is pretty damn spesh. While you’re there, stay on a multi-day catamaran cruise if you can, or at luxe glamping spot Sal Salis. 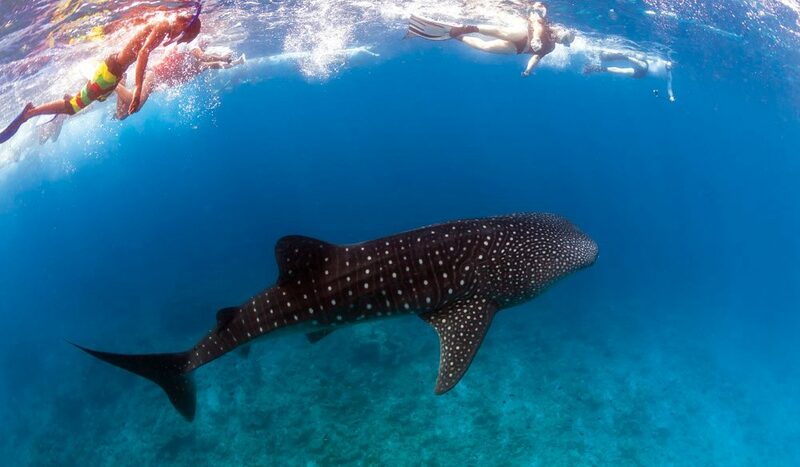 From $395 per person to swim with whale sharks.